Visit Artwalk this summer! – Opening night is July 9th, at 6pm, – the show continues until August 13th. 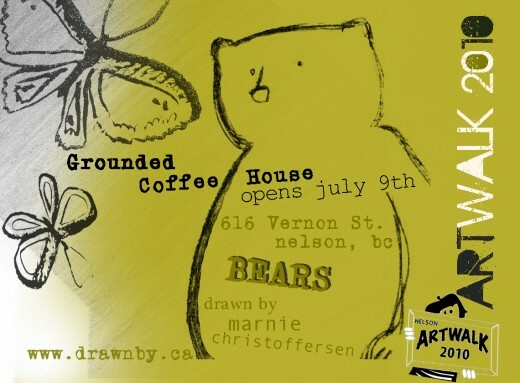 My venue is #6 and is located at Grounded Coffee House – 616 Vernon Street, Nelson, BC (maps of the entire event will be available). There are eight venues in all and each location is representing one, or two artists (16 local artists in all). More ARTWALK info here. Afterwards, for the evening program, the Nelson & District Arts Council are hosting a Fundraising Gala at The Royal on Baker Street in Nelson, 9pm – Closing time. Live painting (artist TBA) and live music, – including one of my favourite local dj’s – Rafferty Funksmith (YAY!). Admission is a sliding donation of $10-20 at the door (a $20 donation includes 2 raffle tickets). *All proceeds to go to the Artist and to the Nelson and District Arts Council – so come out and support your local arts community!! !